WSSU has now won three games in a row, and remains in the race for the CIAA Southern Division title game. It has been a season of runs for Winston-Salem State football. After winning its opener, WSSU lost three straight. Now it has won three in a row after a solid homecoming win over Livingstone on Saturday. WSSU took advantage of turnovers on defense and Kerrion Moore had a big game on the ground to pick up a 34-19 win over LC. Moore rushed for 154 yards and two touchdowns and Daryus Skinner picked off three of Alexis Archies passes to increase his D2-leading total to nine on the year. The Rams forced four turnovers overall, and scored on a blocked punt to open the scoring of the game as well as a PAT returned by De’Andre Blevins. Livingstone got as close as 7-6 with a 28 yard touchdown pass from Archie to Anthony Faraimo. WSSU responded with a 54 yard score by Moore followed by a 52 yarder, as it led 20-7 at halftime. 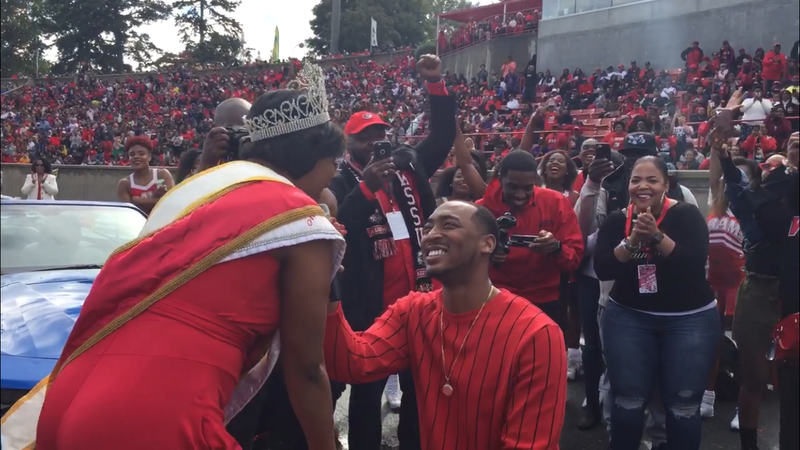 The homecoming halftime show was upended by a wedding proposal on the concourse at Bowman Gray Stadium. It was certainly a moment to remember. The Rams would add 10 points in the third quarter and five in the fourth, while Livingstone scored two fourth-quarter touchdowns to mark the final margin. WSSU improves to 4-3 overall, and remains in the hunt for the CIAA Southern Division title. LC falls to 3-5 on the season.